Hydraulic Breaker for Mini Excavator Details - Quasius Equipment, Inc. The Hydraulic Breaker attachment for the mini excavator takes the work out of hand held air hammers and gets the job done much faster. The 500 lb impact class delivers lots of force to break up even the toughest reinforced cement. The breaker attaches to the boom with a quick attach system and can easily be removed or mounted with one bolt in order to return to the bucket. 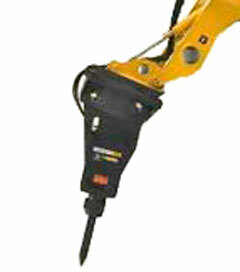 This breaker also has a quick attach mounting system for skid steer loaders. While we are of the opinion that the mini excavator mount is a much better application, there are times went it's more feasible to use an existing skid steer that is at the site. In that case, Click Here for information on the slid steer mounted version. The excavator does offers more flexibility in accessing areas because the excavator's boom is easier to manipulate and you aren't sitting on top of your demolition area like in a skid steer. These gives you greater productivity, less wear and tear on the operator, and greater reach and flexibility in accessing your demolition material. Click Here to return to the John Deere Mini Excavator Page.